There is so much to be thankful for and sometimes we don’t recognize the blessings that we have even if they are swimming in our morning coffee or staring back straight at us in the mirror. 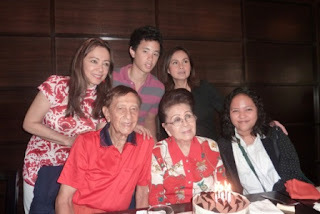 Being alive and healthy at whatever age is one of life’s primary blessings and that fact was reiterated to me once again on June 20 when my mother, Inday Carmona went thru another milestone with vim, vigor and vitality at the young age of 88. Mom’s celebration started with a big lunch at Sugi, hosted yearly by close family friend and adopted sister, Butch Lopez. It was a hearty lunch attended by my siblings, nephews, nieces, in-laws, and adopted family members. Butch made sure that Mom had a birthday cake with candles to blow. In the evening, Mom’s ballroom dancing friends had a big Mardi Gras celebration for her and co- celebrant Tita San Buenaventura at the Makati Sports Club. All of them were dressed to the nines, some of them with masks in true Mardi Gras style. Nonoy Lopez’ band provided the music that kept every one tripping the light fantastic all evening. A raffle of 3 TV sets kept the guests excited. The Carmona family was represented by its patriarch, Don Manolo Carmona, my brother Charlie, son in law Steven Chan, and myself. My sisters Loudette C. Corcellut, Annie Carmona and Marisa Carmona Chan are hosting her a dance party when they come back from Paris in August. 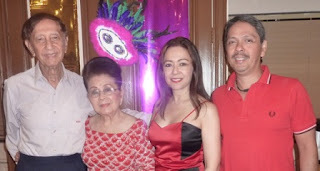 Daddy Manolo, myself and brother Charlie celebrated Mom’s Mardi Gras birthday evening with her. 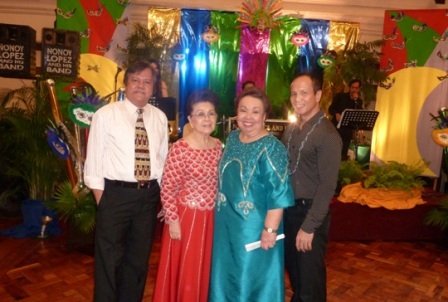 Dressed to the nines, birthday celebrants Inday Carmona and Tita San Buenaventura with their dance partners, Boy Balani and Boboy Avila. Wishing our best Mother in the world, Inday Carmona more healthy dancing years to come!! !